How much does it cost to travel to Cefalu? How much money will you need in Cefalu? €95 ($107) is the average daily price for traveling in Cefalu. The average price of food for one day is €22 ($25). The average price of a hotel for a couple is €139 ($158). Additional pricing is in the table below. These average travel prices have been collected from other travelers to help you plan your own travel budget. Cefalu is a fishing village and beach resort that is located on the northern coast of Sicily, Italy. It sits on the Tyerrhenian Sea and is just 70 kilometers from Palermo and 185 kilometers from Messina. The town has a small population of under 14,000 residents but is a significant tourist destination on the island of Sicily. The city is flooded with millions of tourists every year from around Sicily, elsewhere in Italy, and abroad. During the summer months it is not uncommon for the city's population to triple, putting a lot of pressure on the main streets and roads around town. The city is popular as a beach resort with a youthful vibe and an active nightlife. There are a decent number of historic attractions around town. The town's Cathedral dominates the center of the city and is an impressive sight. It was begun in 1131 and built in the style of Norman architecture. The exterior remains well preserved. The interior was restored in 1559 though parts that date back to the 12th century are still visible. Other churches around town include the Santa Maria dell'Odigitria, the Santa Oliva, the San Sebastiano, the Sant'Andrea, the San Leonardo, the Immacolatella, the Oratory of the Santissimo Sacramento, Chapel of San Biagio, Santo Stefano, Santissima Trinia, Santissima Annunziata, and the Monastery of St. Catherine. You should also visit the Abbey of Thelema which is where Aleister Crowley lived in Sicily before his expulsion by Mussolini's Fascist government. Other sights around town include the Seminary and the Bishops Palace, Palazzo Atenasio Martino, Palazzo Maria, Palazzo Piraino, Osterio Magno, and the ancient Roman baths. If you're interested in visiting a museum, the Mandralisca Museum is an option. There you will find "Ritratto d'ignoto marinaio", or "Portrait of a Man", a painting by Antonello da Messina. 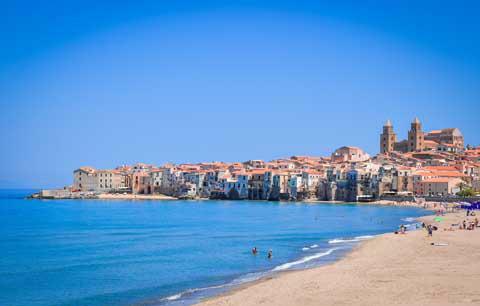 Cefalu is a small town that can easily be explored on foot. The tourist port is about a 15 minutes walk outside of town to the east. One popular activity in Cefalu is to climb "The Rock" so that you can take in the fabulous views of the city. From here you can see the red roofed town as well as the surrounding bay. It's also possible to visit Diana's Temple from here. Other popular places to explore include the harbour as well as the tourist port where there are many fishing boats. Probably the most popular activity is to simply relax on the beach. This is one of the best beaches in Sicily. Some parts of the beach offer umbrellas and beach chairs for rent while others do not. As a major tourist destination, there are many restaurants around town. Most cater specifically to tourists so you can expect to the quality and price to reflect this. Seafood options are plentiful as are budget dining options. It should not be difficult to find a cheap or quick meal. There are frequent trains arriving in Cefalu from Palermo, Milazzo, and Messina. From Messina, many trains continue on to Naples and Rome. The trip from Cefalu to Palermo goes right along the coast and takes about an hour. Buses travel to Castelbuono and Palermo. They can be caught outside of Cefalu's train station and there are several leaving every day. The trip is comparable to the train and it takes about an hour to reach Palermo. During the peak summer months it is possible to take a hydrofoil to either Palermo or the Aeolian Islands. This is not an option year around. Once you're in town then you can easily walk to any of your destinations. The town is generally pedestrian friendly.